Let's face it: most of us have more online accounts than we can control. Email addresses, instant messaging clients, social networking sites… do you really have time to catch up with all of them? If you don't, then you need Digsby, a revolutionary all-in-one IM client with which you can handle all your online contacts under the same interface, even if they belong to different networks. 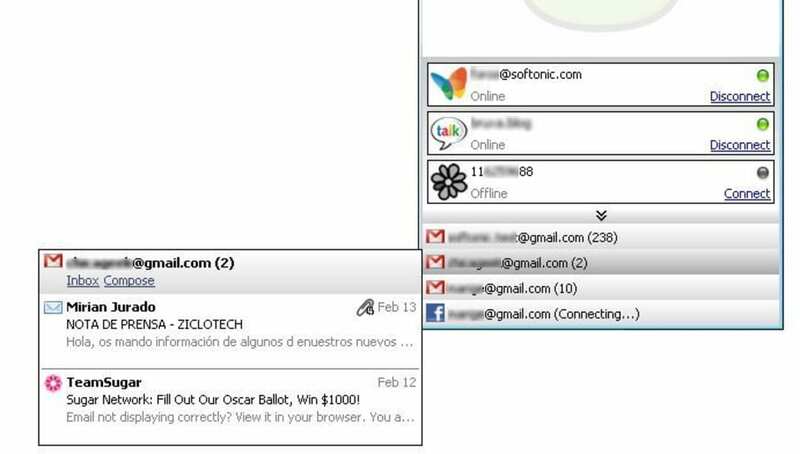 OK, this is probably not that revolutionary, but the real surprise comes when you realize you can also add your email accounts, no matter if they're online or POP3 based, and also your personal profiles in Facebook and MySpace. The result is that Digsby enables you to control pretty much every aspect of your online social life in a very easy way. 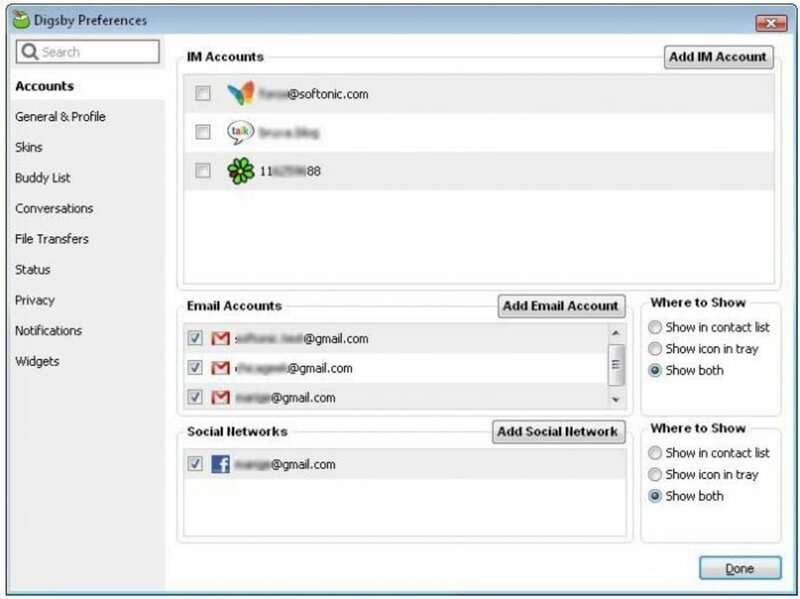 After installing the program, you can start adding as many accounts as you want in order to handle them from Digsby. This includes AIM, MSN, Yahoo!, Google Talk, ICQ, Gmail, Yahoo! Mail, Hotmail, Facebook, MySpace and more. Despite the amount of supported services, they're presented in a very clear, uncluttered interface and organized in tabs. 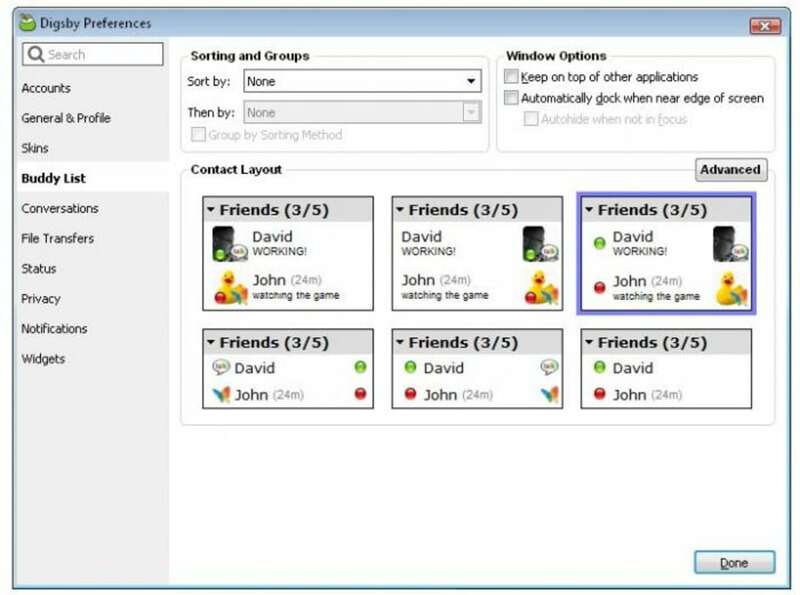 You'll be able to chat with your buddies via IM and also check and organize your email without even having to open your browser. Everything worked fine except for Facebook, which kept on showing a "Connecting…" message though the widget was up and working on my Facebook profile. My ICQ account didn't seem to respond either, but I guess it's got something to do with the fact that Digsby is still in beta stage. Digsby saves chat history, supports file transfer and features an extended settings menu from which you can tweak the program's appearance and performance. The only drawback I found, besides the Facebook connectivity issue, was the lack of speed when starting the program and logging in. But then again, it's well worth it. Auto-Update System: We have a brand new auto-update system in Digsby. Accounts Section: We redesigned the Accounts section in Preferences from the ground up to reflect Services you use with features that you can enable and disable for each service. Email/Social Panels: The email and social network panels on the buddy list got a makeover. Sorting/Grouping: We changed how grouping and sorting options work in “Preferences > Buddy List”. RTL Support: We added RTL support to all of the IM window conversation themes. ICQ Spam Blocker: We added an option in the Privacy settings for ICQ accounts to automatically block friend requests with URLs in them. Stability: We fixed several memory leaks related to account disconnects along with several of the most common crash causing bugs to improve Digsby stability and performance. For people who want everything together!. It's a great app. 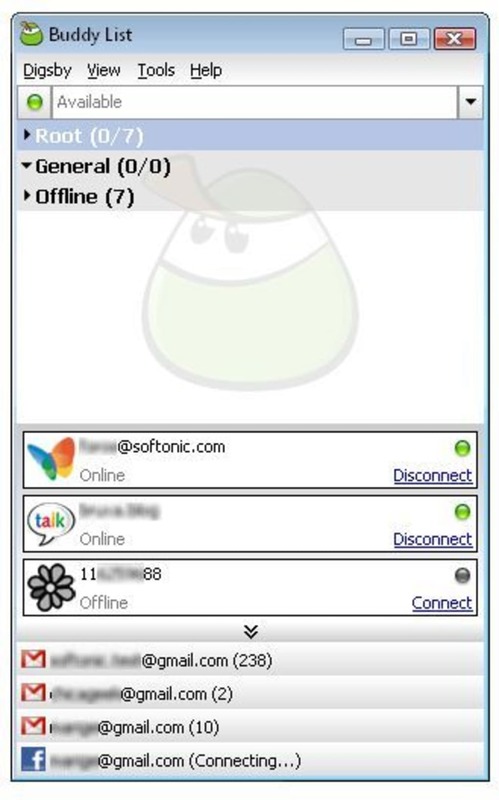 I used it to combine Gmail, Gtalk, FB and FB chat! The most beautiful feature was the one that lets you type the response in the small notification in the bottom right corner? Gmail Chat n FB chat and notifications together. Type an instant reply in the notification balloon. 4 out of 5. As I used this one is good. But, if this package contains Skype as well, then no need to go for any other applications. Pros: AIO. The best multiprotocol messanger I've ever have. I switched to Digsby a couple of weeks ago. I can say only good about it. It is powerful like Miranda but much more user friendly. Great look, easy to use and configure. Best Multi-Service Instant Messenger [Updated Review]. I have decided to compare Multi-Service Instant Messengers by factoring three things. Out of box experience, ease of use and customization. This way users can see what will fit their needs best. Digsby is the best of the bunch offering the best out of box experience and the easiest to use. It's customization isn't one of the best but it's ability to sync your settings makes it a must have. Other nice features people will like is the Facebook Chat, email accounts which you can reply to straight from Digsby, group chat, free video and voice chat and other nice features like all your favorite services. All of this is free and without limitation unlike Trillian in which you have to &quot;pay&quot; for certain features that Digsby offers for free. The downside to Digsby is and always has been is the installer. The newest one makes it harder by making the user push &quot;yes or no&quot; verse just unchecking things. This is bad because people usually just click next after unchecking things and might accidentally think everything is already pre-unchecked and hit yes thinking their hitting the &quot;next&quot; button. 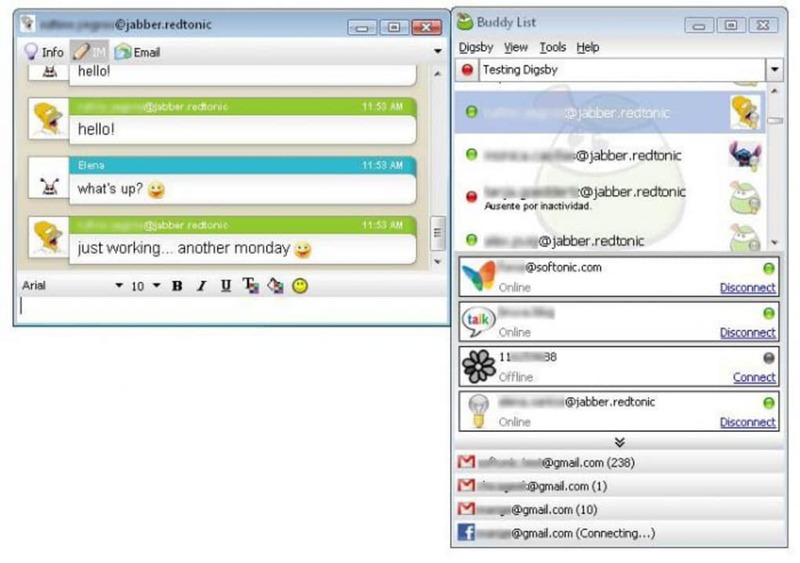 Overall Digsby is a must have for those who want the best Instant Messenger experience without limitations. 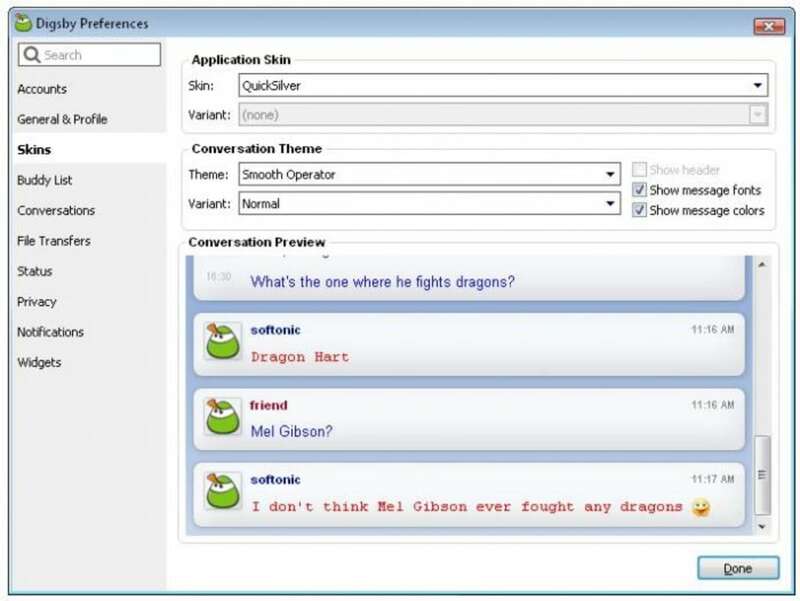 However if you want great themes and emoticon, you will be better off with Trillian which seems to have the best themes around. No limitations Or Paying For Certain Features. 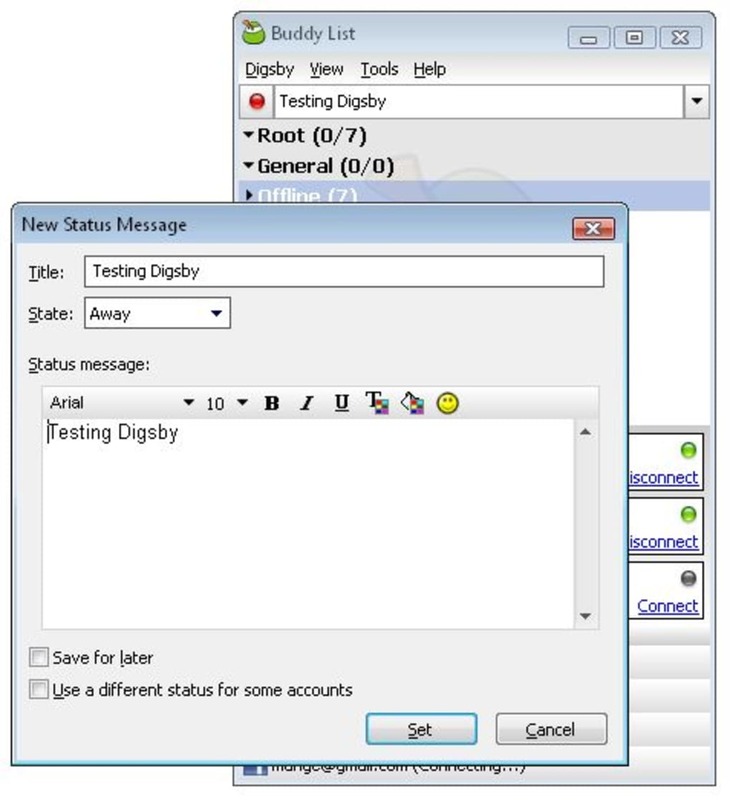 Ability To Answer Emails From Within Digsby. Good But Use With Caution. Digsby is a great Instant Messenger without a doubt. It offers features others charge for but it comes with a price. Digsby has been switching back and forth with their installers. They even went so far to use an adware installer call freeze. They went back to their old installer but it also tries to get you to accept things or alter stuff. The bad thing is they change things without warning so whenever you download Digsby you have to be extremely careful to watch over the installer because each release can bring something new that is unwanted. If you can get by that Digsby has some truly nice features such as skins and themes. Ability to voice and audio chat. Auto Updating and saving ALL of your preference [Wish Trillian Astra has this]. It's now playing also allows for WAV files which Astra doesn't allow for. You also have facebook IM, as well as social networking capabilities with LinkedIn, MySpace, and of course Facebook. Not to mention the countless number of Instant Messenger services it provides. It even offers to auto log you into these Social Networks and Email accounts so all you have to do is click on the service you want to go to and it log you in automatically. Another useful feature is being able to respond to people in the notification popups so you can talk to someone who instantly signs in instead of having to go into the contact list. Very good Instant Messenger but can be very dangerous as well. What do you think about Digsby? Do you recommend it? Why?